Family forests (also known as non-industrial private forests or “NIPF” lands) are vital to the economy and quality of life in the Inland Northwest. These lands are critical for wildlife habitat, timber production, scenic quality, and many other values. 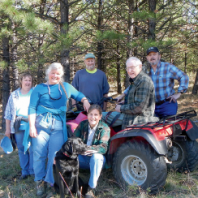 • Strengthen the skills of consulting foresters, state-employed service foresters, and other natural resource professionals who work with family forest owners. • Serve as a forum to provide updates on emerging technology and knowledge applicable to family forestry.